IDI in Digital Humanities Speakers Series | Click Here. Announcing the first of this year’s IDI in Digital Humanities Speakers Series! Glen Worthey is Digital Humanities Librarian in the Stanford University Libraries, and head of the Libraries’ Digital Initiatives Group. 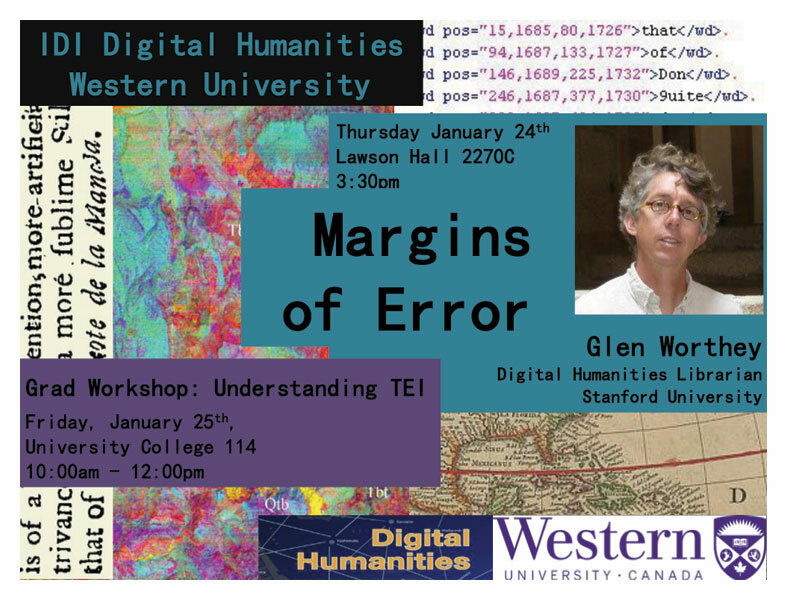 Glen has been active in the digital humanities since about 1995, was a co-host of the international “Digital Humanities 2011” conference at Stanford. He’s currently a member of the Executive Board of the Association for Computers and the Humanities (ACH), the Steering Committee for the Alliance of Digital Humanities Organizations (ADHO), and the Board of Directors of the Text Encoding Initiative Consortium (TEI-C). Glen’s library work is focused on the selection, creation and curation of digital resources for humanities research and teaching at Stanford, and he is a member of the Stanford Literary Lab. His academic background and interests are in Russian literature (in which he is currently ABD at the University of California, Berkeley), Spanish language, translation theory and practice, and children’s literature and culture. With thanks to Elika Ortega and Kimberley Martin for the work on this!